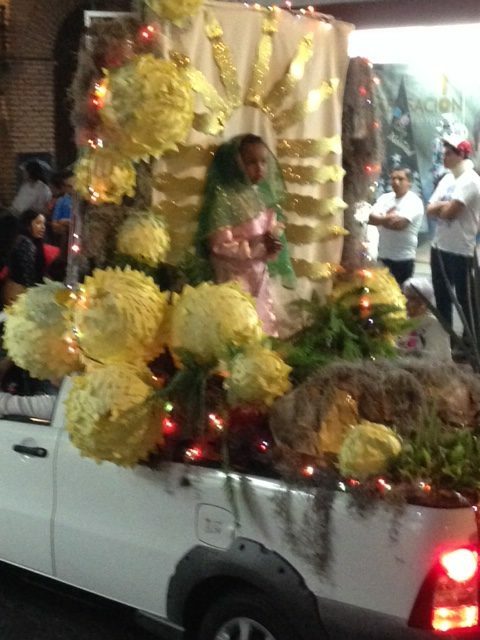 Incredibly young girls posing as the Virgin on floats through the city. 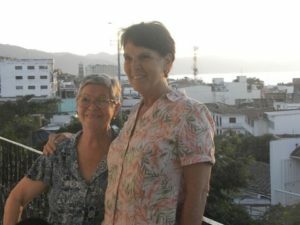 Jim and I met with friends on the terrace of our lovely penthouse Airbnb place on Columbia (with buses running on the street below until all hours of the night) to drink a little tequila and share a birthday cake that I found at a pasteleria in the neighborhood. Juan Carlos’ mother, Maria de Luz and me. 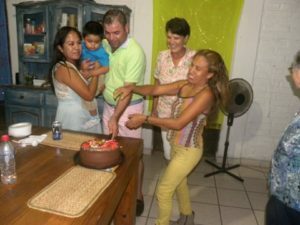 The birthday cake with Lupita and Jonathan. Then we hit the streets and walked with thousands of pilgrims carrying banners, singing to the Virgin. 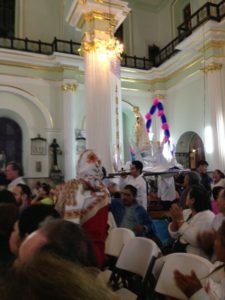 There were floats mounted on pickup trucks, drum and bugle corps and dancers of all kinds, many with feathered headdresses and native looking costumes but a picture of the Virgin on their chests. These were groups of workers from fancy resorts, local business employees, neighborhood groups, etc. At midnight fireworks were shot from the Church top and famous Mexican entertainers entered the church to sing their praises. We got home about 2:00 am. Awesome! 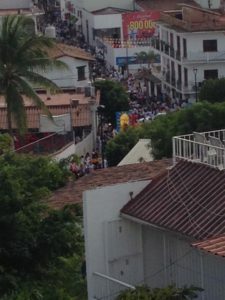 View from the roof of our Airbnb showing people crowding the streets below leading to the church. Procession entering the church with replica and songs to the Virgin. 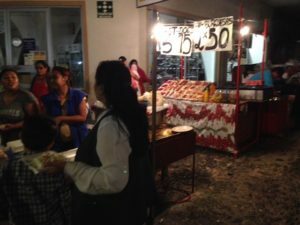 Piles of tangerines and trucks of tamales lined the parade route.